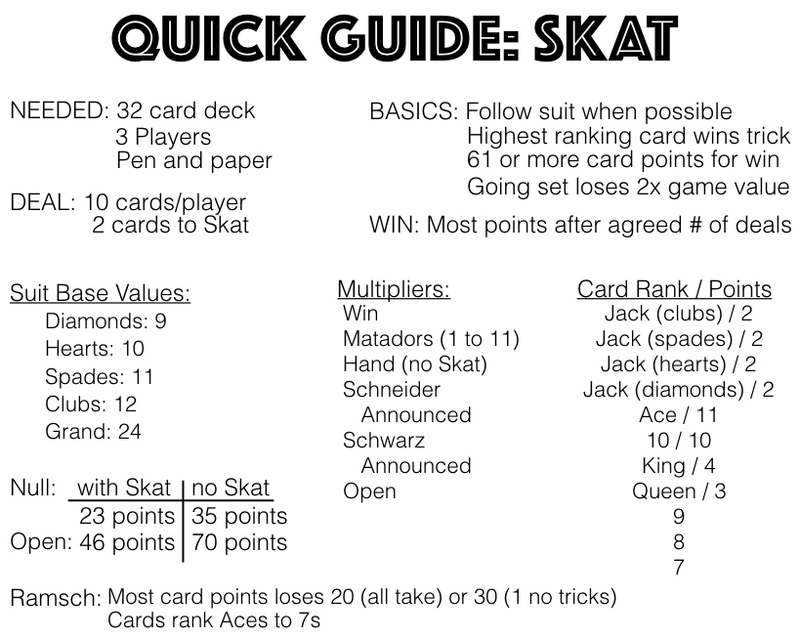 Skat is an strategic, trick-taking card game played with 3 players. Bid wisely and play correctly to maximize you points. Below is the video tutorial and explanation. Deal: 10 cards are dealt to each player. First, 3 cards are dealt to each player. Next, 2 cards are dealt face down into the middle to form the Skat. Then, 4 more cards are dealt to each player, and finally, 3 more cards are dealt to each player. Objective: The object of the game is to win the most points by winning the bid and making the contract announced. Bidding: The player left of the dealer is call the forehand, the player right of the dealer is call the middle hand, and the dealer is call the rear hand. The opportunity to determine trump, or call null, is given to the forehand. The middle hand gets the first chance to steal that opportunity by stating a bid amount. If middle hand bids, forehand can accept the bid, or pass. If forehand thinks he/she can make that many points he/she will accept it. At this time middle hand can increase the bid, and forehand has the option to accept it again. This goes back and forth between middle hand and forehand until one passes. The winner between forehand and middle hand will then repeat the process with the rear hand. If middle hand and rear hand both pass without making a bid, Ramsch (see below) may be called by forehand. The winner of the bid will get to choose the game type for the round, and can exchange cards from his hand with the cards in the Skat if he/she chooses. The 2 players that lost the bid become partners. Trumps: the bid winner will determine a trump suit for the round. All the jacks are always considered part of the trump suit. Grand: jacks are the only trump cards for the round. Null: the bid winner will try to avoid taking a trick during the round. Card rank changes to Aces, King, Queen, Jack, 10, 9, 8, 7. Ramsch: jacks are the only trumps, and the player that wins the most card points loses the game. There are no partnerships in this game style, and the Skat is not used. Game Play: Forehand plays the first card into the middle. Every player must follow the lead suit by playing a card in the same suit that was led whenever possible. If a jack is led, a jack or trump suited card must be played to follow the lead. The winner of the trick is the player who played the highest ranking trump card. If no trump card was played, the winner is the player with the highest ranking card in the lead suit. The player that wins the trick leads the next trick. The winner of the game is the player with the most points after an agreed upon amount of deals. Each player should deal the same number of times. Scoring: Players review the cards takin in from the tricks they won. The 2 players that lost the bid combine their cards won. The cards in the Skat are counted by the bid winner. The value of the cards are calculated. The bid winner needs a card total of 61 or more points to get the win for the round. If the bid winner gets the win, he/she is awarded the base value of the game chosen times the appropriate number of multipliers. A player whose highest card is the Jack of Hearts is without 2 matadors. This equals a 2 matador multiplier. A player with the Jack of Clubs, Jack of Spades, and Jack of Hearts, but without the Jack of diamonds is with 3 matadors. This equals a 3 matador multiplier. A player without the Jack of clubs, but with the jack of spades is without 1 matador. This equals a 1 matador multiplier. A player with the Jack of clubs (top ranked card), but not the Jack of spades (next top card), is with 1 matador. This equals a 1 matador multiplier. Hand - playing a trump or grand game without using the Skat. Schneider - winning 91 or more card points. Announcing and making Schneider gives the player both the Schneider and Announcing Schneider multipliers. Announcing and making Schwarz gives the player the Schneider, Announcing Schneider, Schwarz, and Announcing Schwarz multipliers. Playing open gives a player every multiplier. Going Set: A player loses double the game value played if he/she does not get 61 game points, gets less points than bid, does not get Schneider when announced, or does not get Schwarz when announced. Null Game: If success in avoid all the tricks in a null game, the bid winner is awarded 23 points if the Skat was used, or 35 points if the Skat was not used. The points are doubled if the player plays the hand open. Ramsch: The player that got the most card points in the round loses 20 points if each other player took at least 1 trick, or 30 points if 1 player took zero tricks. If a grand game is called, only the jacks are trump. This means if a jack is lead, a jack is required to be played in order to follow suit. The minimum bid is 18. Every hand will have a minimum multiplier of 2 for the win, and being with or without a matador. The lowest base valued suit is the diamonds at 9. 9 times 2 is 18. A player’s matador multiplier could change based on the cards in the Skat, even when a player does not look at the skat. For example, a player that was without 2 matadors could get the jack of clubs in the skat at the end of the game. This changes his/her without 2 matadors to with 1 matador.